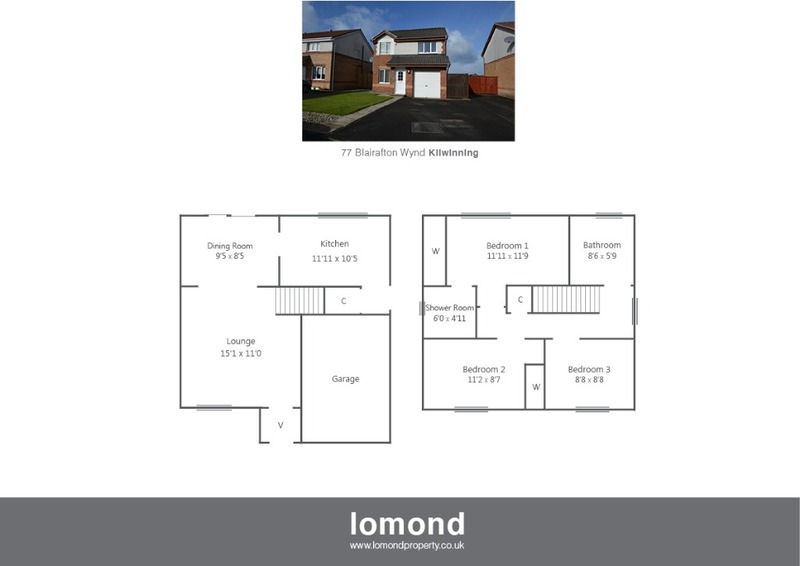 Situated in the ever popular Whitehirst Park area of Kilwinning, 77 Blairafton Wynd is a spacious detached house. The property has three double bedrooms and benefits from modern kitchen, garage and driveway. The property is in walk in condition and has an open outlook to the rear. Entrance is gained through entrance vestibule which leads to the spacious lounge. The lounge has a front facing window and is open plan to the dining room at the rear of the property. The dining room has patio doors to the rear garden and a door gives access to the kitchen. The kitchen is a modern style with ample units as well as storage cupboard. There is a gas hob and oven as well as door access to the side. The stairs in the lounge provide access to the upper level. The family bathroom has vanity unit storage and has a mixer shower attachment on the bath. Bedroom Three is a front facing double bedroom. Bedroom Two is also a front facing double but also has a built in wardrobe. Bedroom One is a rear facing double with views over the nearby countryside. There is built in wardrobes and an en suite shower room completes the accommodation. Externally the front garden is lawn. A tarmac drive way allows off street parking for several cars and access to the garage. The rear garden is enclosed by timber fence and is also lawn with slabbed patio area. A timber shed allows for external storage and a gate to the side allows for bin access. Whitehirst Park is a popular residential area within easy reach of Kilwinning Town Centre. The town offers a range of amenities such as shops, bars and restaurants. There is a frequent train service from Kilwinning Train Station to Glasgow and other Ayrshire towns. On entering Kilwinning from the A78 by pass continue along Stevenston Road and at the traffic lights turn left onto Whitehirst Park Road. At the roundabout take right and then take the third left into Blairafton Wynd. The property can be found at the top of the street on the left-hand side.